The first major trench lines were completed in late November 1914. At their peak, the trenches built by both sides extended nearly 400 miles from Nieuport, on the Belgian coast, to the Swiss border. Among the Allies, the Belgians occupied 40 miles, the British occupied 90 miles and the French occupied the rest. Experts calculate that along the western front, the Allies and Central Powers dug nearly 6,2500 miles of trenches by the end of 1914. "[the bodies] we could not get from the German wire continued to swell ... the color of the dead faces changed from white to yellow-gray, to red, to purple, to green to black." Robert Graves, poet, novelist, critic. The Allies used four "types" of trenches. The first, the front-line trench (or firing-and-attack trench), was located from 50 yards to 1 mile from the German's front trench. Several hundred yards behind the front-line trench was the support trench, with men and supplies that could immediately assist those on the front line. The reserve trench was dug several hundred yards further back and contained men and supplies that were available in emergencies should the first trenches be overrun. By mid-November 1914, the territory between the opposing front trenches was marked with huge craters caused by the shelling; nearly all vegetation was destroyed. Whenever possible, both sides filled this land with barbed wire to slow down any rapid advances by the enemy. The machine gun and the new long-range rifles made movement in this area almost impossible. Both sides quickly recognized that assaults against the enemy trenches were suicide if begun in broad daylight, so attacks tended to take place just before dawn or right at dawn. Poison gases tended to be more effective in the mornings, as the colder air and absence of wind allowed the gases to stay closer to the ground for longer periods of time. Except for artillery shelling, daytime was relatively safe for the soldiers on the front line. Once the sun went down, men crawled out of their trenches to conduct raids, investigate the layout of the terrain, and eavesdrop near the enemy lines to pick up information on their strengths, weakness and strategies. Many men chose to shave their heads entirely to avoid another prevalent scourge. Given that each side's front line was constantly under watch by snipers and look-outs during daylight, movement was logically restricted until night fell. Thus, once men had concluded their assigned tasks they were free to attend to more personal matters, such as the reading and writing of letters home. Men who had not been afforded the luxury of a bath in weeks or months would offer the pervading odor of dried sweat. The feet were generally accepted to give off the worst odor. Add to this the smell of cordite, the lingering odor of poison gas, rotting sandbags, stagnant mud, cigarette smoke and cooking food... yet men grew used to it, while it thoroughly overcame first-time visitors to the front. When the spring of 1915 was reached, the ideas of the generals of the British and French were simple. Somehow, break through the enemy’s line of trenches, secure that position and send many troops through that gap, when a war of movement will return. The allies believed they could win a war of movement, the problem was how to achieve a breakthrough? After a few unsuccessful attacks, the allied commanders devised a new plan, a war of attrition. The idea now was to kill as many Germans as possible, until they run out of men. Whether the British or French took heavy casualties was irrelevant, as long as the Germans ran out of men first. A breakthrough was not so important now, attacks to gain ground became the priority and this was to be achieved by capturing the frontline of an enemy trench, using the following plan. A heavy artillery bombardment would go on for days, supposedly destroying all resistance. Then British soldiers would march unopposed across no-mans-land (the wasteland between the front line trenches of the two sides) and capture the front line enemy trench and possibly the trenches behind it. This diagram shows what was supposed to happen… However the reality (shown below) was somewhat different. 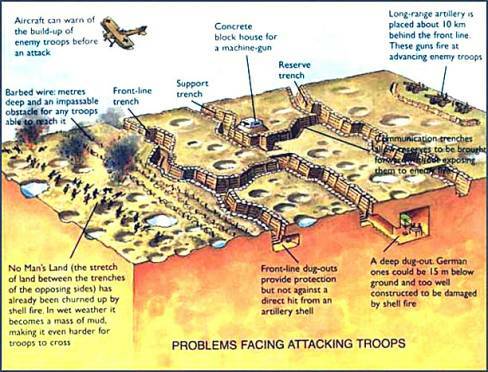 One the reasons this plan failed most of the time, was because the defenses of the German trenches were far better than the British had anticipated. Also any element of surprise was lost, because the German planes could see troops being gathered and the first artillery fire signaled the start of the attack. When the shelling stopped, the Germans would come out of their underground concrete bunkers and be ready for the British, who were held up anyway by the barbed wire, which hadn’t been destroyed. The problems the British faced are shown below. One of the worst problems that faced attacking troops, was the mud of no-mans-land. Even without guns or horses, the mud was still very hard to cross. As we have seen, British offensive troops faced many problems, which caused high casualties. Also, well-defended German trenches and mud in no-mans-land took many lives.